Formative assessment is an essential part of understanding the needs of your students and planning your future instruction. If we can view student learning as a journey from A to Z, then we need to have pit stops along the way to help assess how they're doing in their journey. Of course, the ultimate destination is the mastery of the standard. Graphic organizers require students to process information and organize the content in a logical format to demonstrate reading comprehension. They are especially helpful for students to have a visual/spatial representation of the content. Let me add that all the information in this blog post can easily be implemented into your classroom without buying a single product in the examples below. You can use these tips for formative assessment with any curriculum and/or resources in your teacher toolkit: printable, interactive, and digital. Students learn in different ways and at different speeds. Offering students multiple modes of assessment can help the student to demonstrate mastery of the standard in their preferred way of learning. It can help the teacher to see how the student learns best through the differentiation of the mode of assessment. When I formatively assess my students in reading, I assess multiple times, with multiple texts, and in multiple modes: digital, printable, and with interactive notebooks. My primary form of reading assessment is using graphic organizers that come in the form of printables, interactive notebook pages, and digitally using Google Slides or the Pic Collage app. The graphic organizers assess ONE specific reading standard and use the precise academic language within the standard. They are clearly labeled with the standard so that I have a quick form of documentation of mastery and parents do as well. We use standards-based grading in my county and this is, by far, the easiest way that I have found to have perfect documentation for that as well. I created these printable graphic organizers in 2011 because I was piloting the Common Core Standards and had absolutely no materials that were aligned to the new standards. I wanted a quick one-page formative assessment that could be used with any text (basal series, picture book, close reading passage, chapter book, etc) to demonstrate understanding of the specific standard being taught. This way I could differentiate the actual text to the student's ability, but maintain the level of mastery required for the standard. They are labeled with the Common Core Reading standard on the top right of each page. There are one or more graphic organizers for every single Literature and Informational Text standard. I also use interactive notebooks as a formative assessment. This is more for guided practice of the standard usually with a text that we have read together. These are simple to cut and easy to use. I wanted the students to have a record of their learning in the form of an interactive notebook but didn't want to waste instructional time on the cutting and gluing. I created these interactive graphic organizers with that in mind. They are also labeled with the standard so I can easily assess and document mastery of the standard and they were created using the specific language in the standard. They are simply a recreated version of the printable graphic organizers in an interactive format. As our schools are moving more towards paperless classrooms and digital learning environments, I saw a need to create a digital version of the graphic organizers. They are accessible in Google Slides on a computer or tablet, or they can be accessed using the Pic Collage app on a digital tablet or other device. Again, the standard is clearly displayed on the slide or image and the language of the standard is included in the graphic organizers. They are pre-filled with text boxes so all your students need to do is click and type. Combining these multiple modes of formative assessment in reading not only helps the students to be able to demonstrate their understanding in multiple ways, but it also helps the teacher to have a complete system for documenting mastery of the standards. Throughout the week students can use the interactive notebook graphic organizers, the digital graphic organizers, and then the printable graphic organizers as a more formal assessment. All the while only working on that single reading standard being assessed. In this example, RL.2.5 Overall Structure is the standard being assessed in multiple modes here. Graphic organizers are research-based models of assessing students' reading comprehension and when paired with multiple modes of assessment, you have a complete system for formative assessment in reading. 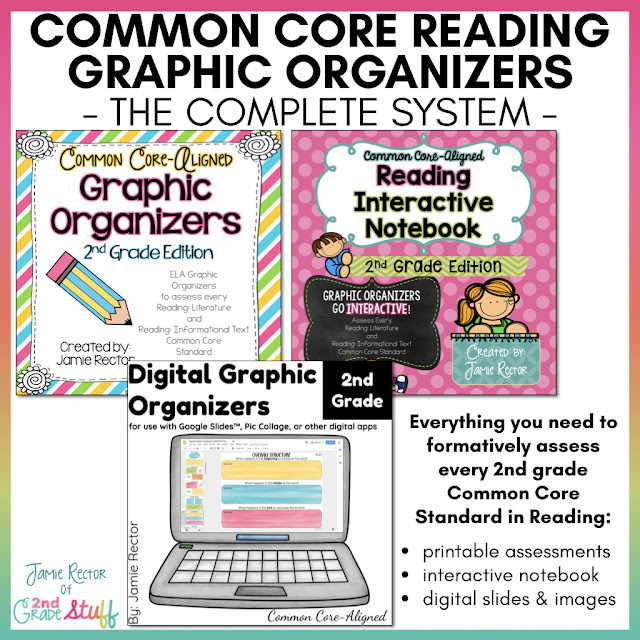 With these graphic organizers being directly tied to the standards and easily used with any text, you have everything you need to assess your students using printable, interactive, and/or digital graphic organizers. Standards-based grading and documentation of mastery has never been easier! You can check out The Complete System in my TeachersPayTeachers Store HERE or by clicking on the image below. If you're interested in a FREE SAMPLE of my Common Core Reading Graphic Organizers (printable version), just enter your name and email in the form below and it will be sent straight to your inbox. Remember to check your spam, junk, or promotions folder if it's your first time subscribing. Email me with any questions at Jamie@2ndGradeStuff.com.